Do You Do Any Conferences In My Area? Why choose a ladder lift from Safety Hoist? Our innovative NEW electric hoist is the first material hoist to safely move the operator away from the load using a uniquely designed pendant control. The pendant is connected to the hoist using a 16-foot cord, allowing the operator to stand at a safe distance away from the load. We sell the highest quality ladderlifts to businesses like yours. Whether you are a contractor installing roofing, siding, skylights, solar panels, or windows or a materials manager at a warehouse or storage facility, we are committed to your safety and to excellence, quality, and service. Our power ladders are designed to be the lightest AND most durable in the roofing industry. Safety Hoist Company roofing ladders can be used to lift a wide variety of materials. We’ve worked hard to accommodate all types of roof shingles including the newer, heavier shingles. You can also hoist the following with special attachments for our ladder lifts. For 50 years, our sole focus—our specialty—has been designing and manufacturing material, platform, and ladder hoists. 28 ft. length standard, maximum 44 ft.
Click here to see how our ladder hoist outperforms the alternatives in our video. Manually carrying materials—especially heavy or bulky items—puts you and your workers at high risk of injury. The price for medical leave, workers compensation claims, and OSHA fines for non-compliance with regulations is high. Cut your risk and your costs with a Safety Hoist power ladder. A boom truck requires special training and a license to operate, making it difficult to rent for small jobs. Because it is prone to cause property damage, your expenses can add up quickly. Eliminate the need for special training and an operator’s license and cause little or no property damage with a Safety Hoist shingle elevator. A roofing conveyor needs a lot of space. Like a boom truck, it requires special training, making it difficult to rent for small jobs. It, too, has the potential for producing property damage, causing this to be another expensive choice for moving roofing materials. You save space; eliminate the cost of repairing driveways, landscaping, and lawns; and can tackle any size job with a Safety Hoist roofing ladder. Start moving materials more simply and safely at an affordable price. Give us a call, toll-free, at 877-994-6478 or contact one of our authorized distributors. Interested in adding Safety Hoist products to your line card? Click here to download the Safety Hoist brochure with descriptions of our laddervator models. 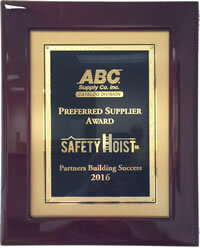 Safety Hoist Company has been recognized as a Preferred Supplier for ABC Supply Company Catalog Division for the second time. Hussain Al-Yousuf, business development manager of the ABC Supply Co. Inc. Catalog Division, presented the award to Safety Hoist company president Bob Delaney at the 21st Annual Preferred Supplier Partnership Meeting in Beloit, WI on September 13, 2016. © 2018 Safety Hoist Company. All Rights Reserved.